Kors shareholders have high expectations, but today's quarterly report hasn't changed the company's long-term prospects. Michael Kors (NYSE:CPRI) has long been a highflier in the upscale fashion industry, and its lines of luxury apparel and accessories have dominated those of its rivals recently. Yet its stock fell sharply today even though Kors this morning reported strong growth in its fiscal first-quarter earnings report. As the stock market seems to wobble from its five-year bull market run, some Kors shareholders clearly believe the company can't live up to the high expectations that growth investors have for the retailer. Yet others think those fears represent a buying opportunity for smart long-term investors to take advantage of solid future prospects for Michael Kors' earnings. On its face, Michael Kors produced more of the sharp growth that investors have come to expect. Overall sales jumped 43% year over year, with comparable-store sales rising by more than 24% and higher store counts also adding to the pace of revenue growth. Net income soared more than 50%. In addition, Michael Kors has done a good job of penetrating markets both domestically and internationally. In its North American segment, revenue climbed 30% on an 18.7% rise in comps. But the international scene is where Kors truly cleaned up in the quarter, with sales more than doubling in Europe and climbing by 89% in Japan. Comparable-store sales growth of more than 54% in Europe and almost 49% in Japan shows that Michael Kors has turned its rising worldwide reputation for quality and prestige into solid business growth. Source: Michael Kors Investor Relations. As with any other high-growth stock, Michael Kors faces the ongoing challenge of keeping its percentage gains as high as possible despite an ever-growing baseline on which to judge that growth. What really seems to have sent investors into a panic, though, is Michael Kors' future guidance on growth. For the current quarter, Kors is assuming that its comparable-store sales growth will fall into the high teens -- a huge drop from historical levels even in a relatively slow quarter for the company. In addition, Kors' full-year guidance predicts similarly sluggish growth in comps. Moreover, Kors specifically noted that the industry was trending toward greater markdown activity, which could hurt margins and reduce future profit growth. That has many investors fearing that the best days for the luxury retailer are already in the rearview mirror. 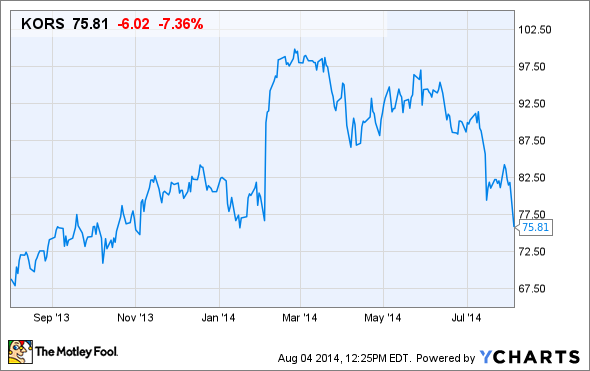 Is Kors reacting to market fears? Yet those who follow Michael Kors shouldn't be surprised by the company's lowball guidance. For example, Kors had given guidance for the fiscal first quarter that assumed growth in comps of just 20%, creating similar worries among many investors. With the actual result coming in more than 4 percentage points above that level, Kors shareholders realistically don't have to worry about an imminent drop in comps growth below 20%. Similarly conservative guidance in the past only raises the probability that Kors will outpace its own outlook in the current quarter. In many ways, moreover, Michael Kors' stock appears to be moving less because of its own individual-company results and more because of general fears about the broader stock market. Declines in the past month have corresponded to poor performance on momentum stocks throughout the market, as investors reduce their exposure to highly volatile stocks almost irrespective of their relative merits. Finally, Michael Kors has shown acumen in investing in its own growth. International expansion plans should capitalize on the huge foreign demand for Kors' products, and other moves such as creating a men's store concept and fleshing out its line of more affordable accessories aim to broaden Kors' appeal and make it more accessible to a larger customer audience. Some fear that those efforts could dilute the brand, but Kors has consistently outpaced expectations in the industry, defying trends that have hurt other retailers badly. The drop in Michael Kors' stock reflects the huge weight that traders place on short-term results. But Kors CEO John Idol has consistently told investors that he isn't aiming at quarter-to-quarter performance, and as long as Kors' long-term efforts keep bearing fruit, share-price drops offer short-term discounts for opportunistic investors.